Leadership Glades is an exciting program designed to prepare potential leaders to meet the challenges facing the Glades area. Participants explore critical issues through a series of seminars and related activities. Interaction with key decision-makers, experts, community leaders, and representatives of local government assists participants in better understanding the forces that impact their business, community, and daily lives. Leadership Glades believes the cooperative effort of well-informed citizens is the key to preserving and enhancing the quality of life that Glades residents enjoy. 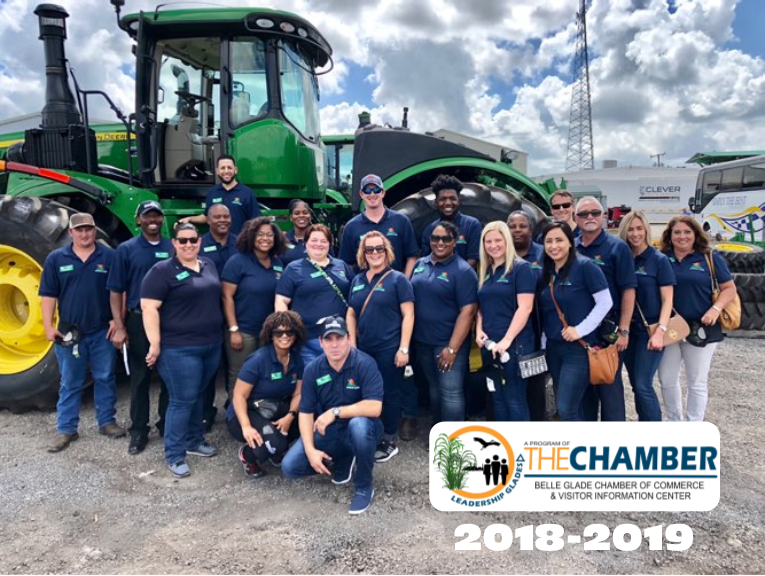 If you are interested in serving the community, committed to professional growth, and dedicated to the future of the Glades, then you are a candidate for Leadership Glades. The Business & Economy Day program is designed to familiarize you with the day-to-day challenges of large and small businesses in the Glades. This day will include tours of area businesses and an opportunity to interact with the heads of these economic engines. You will learn not only about specific challenges but also the joys and profitability of doing business in the Glades. Wear your walking shoes as this day will provide an even balance of tours and presentations. Come prepared to learn and to challenge the presenters with questions about strategies for growth and future business development in the Glades. The Education & Cultural Arts Day program is designed to familiarize you with the advancement and challenges in education in the Glades. The day will include tours and presentations on many types of educational facilities in the Glades, and may include a magnet school, a high school, an academy, a private school, a state college, a museum, and/or a theatre. You will meet educators, administrators and curators. Wear your walking shoes as this day will be very busy. However, at the end of the day, you will certainly have a better understanding of the challenges faced by our educators in the Glades. Health & Human Services Day is designed to familiarize you with the myriad of services and programs available for the delivery of health care and social services in the Glades. This very busy day will begin with a tour of Lakeside Medical Center, and may include tours or presentations of Lighthouse Café/Ella’s Closet, Alzheimer’s Community Care, PANDA (Pregnant and Addicted), Children’s Services Council, and/or the Health Care District of Palm Beach County. One of the highlights of the day will be an Emergency Response presentation. Wear your walking shoes and clothing appropriate for outdoors on this day because we are going to cover a lot of ground, some of which will be outside. Be prepared to be overwhelmed by the quantity and quality of health care and human services in the Glades. The Agriculture & Agribusiness Day program is designed to better acquaint you with our leading industry in the Glades, agriculture. This day you will tour fields and mills as you explore the fascinating world of Glades agriculture. Tours may include vegetable, sod and sugarcane fields, a rice mill, a sugar mill, the University of Florida Research and Education Center and/or a packing house. You will meet farmers, scientists, field workers and equipment operators. It will be loud and dirty sometimes, but it will most certainly be educational, fun and even inspiring. Break out your boots, a cap or hat and blue jeans today. You won’t want to miss even a second of this day. You may even get to take home some delectable samples. The Government & Judicial Systems Day program is designed to expose you to the inner-most workings of our County and Municipal governments and the Criminal Justice system of the Glades. The day will include a roles and responsibilities presentation by the elected constitutional officers of Palm Beach County. You may sit in a court room and observe judicial proceedings and our criminal justice system in action. You’ll meet law enforcement officers in the Glades and enjoy a law enforcement training demonstration and/or tour the jail. Then, we will shift gears and immerse ourselves in a tour of a public works facility and the municipal operations of our Glades cities. This day combines presentations with tours and brings you face-to-face with many of the most influential people in our cities and county. Be sure to bring some of your best questions and challenges to this session, as you interact with people that are no strangers to difficult questions and challenging opportunities. The Environment & Water Management Day program is designed to familiarize you with the workings of the South Florida Water Management District, focusing on the importance of the District to the Everglades, the Glades communities and the Everglades Agricultural area. There will be several tours as well as many sit-down informational presentations. The day may include a tour of the S5A pump station, at 20 mile bend, a presentation on the history of the Everglades Agricultural area and water management, and a native Florida Wildlife presentation. There is a great deal of information passed on to you throughout the day. Think ahead about the issues you are hearing in the news regarding the Glades and be prepared to ask the experts for the truth. This two hour session, held immediately following the Chamber breakfast at Lakeside Medical Center, is your opportunity to give us your honest feedback about your experiences. This information will be used by the Advisory Board and Facilitators to help continuously improve our program.